The biggest skin care mistake you can make and how to avoid it. There is more to skin care than most people realize. In this industry, I see people, even my clients, make one skin care mistake time and time again. This particular skin care mistake usually means the difference between achieving your goals and not. What’s the biggest skin care mistake? The biggest skin care mistake you can make is thinking that drugstore skin care products or skin care products from a direct sales company or third party reseller are just as good as professional grade skin care products. They are not. Here’s what you need to know. When you buy skin care products from anyone other than a professional studio you are running the risk of buying a product not meant for your skin or a diverted product. While the label on the box could say one thing, the products inside could be fake or even expired. Expired products can cause adverse reactions and reverse progress we’ve made in the studio. I carefully select the products I use in my studio based on quality and performance. I pay careful attention to what is in each product and I know which ingredients are going to be most helpful to my clients. In some cases, in order for me to carry a product line, I must meet certain criteria set up by the distributor as they want to know that only professionals are using and distributing their products. So, there is often a two-step process that ensures the products that make it to your skin are the best available. When you buy from a drugstore, a third party reseller or a direct sales rep this process is not happening…at all. When I discuss professional skin care products with clients, price often comes up. I understand drug store products can be less expensive. That said, what many people fail to realize is that the products you are buying and using could actually be contributing to your skin problems. They could be too harsh, too drying, or even causing excess build up on your skin. Formulations are also key. They may be formulated with active ingredients with other non-active ingredient which makes the active ingredients not as active, see where this is going? Without guidance from a trained professional, you could be doing more harm than good and end up spending money on treatments to reverse the damage those products are causing. I’m not trying to speak badly about the direct sales reps of the world but when it comes to skin care, most sales reps have no actual training in skin conditions and how to address them. I am constantly seeking out treatments that deliver results you are wanting, I seek out constant education in skin care. They are given product knowledge about the line they are supposed to sell. So if you tell them you are struggling with acne, they will sell you their acne line. They aren’t going to evaluate your skin and your overall health to determine if something else may be causing your acne as a trained Esthetician would. Your skin does not fit in a one size fits all regimen. You have specific needs and your skin will change and will need different ingredients that you may not find in a generic home care regimen. In my studio, I will not perform any of my clinical treatments on clients that aren’t using my recommended home care because of everything I mentioned above. I don’t want to risk an adverse reaction when the products you’re using at home don’t mesh with the in-studio treatment. I also don’t want my clients to waste money on treatments that aren’t going to deliver the results they could if they aren’t using the proper at-home care. 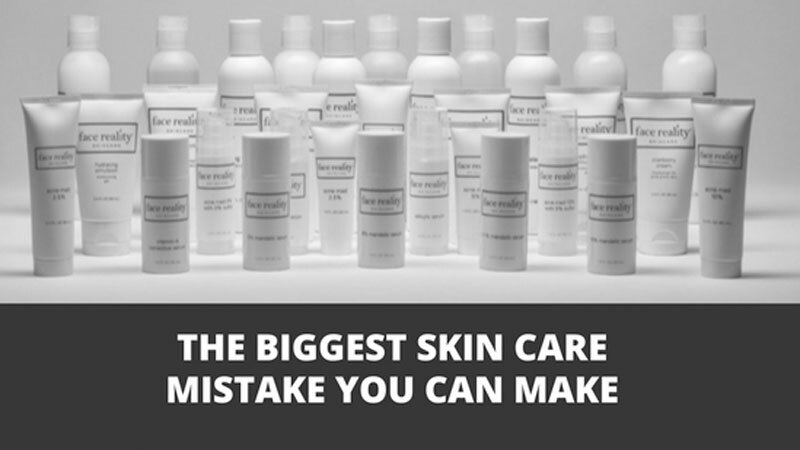 So, don’t make the biggest skin care mistake there is! Contact me to go over your at-home skin care regime. We can evaluate what’s working and what’s not, then I can make recommendations to you on how to get the most out of your at-home skin care routine.